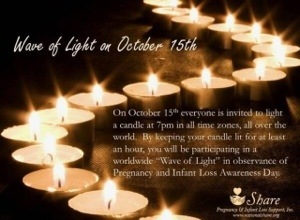 Today I’m participating in the wave of light for pregnancy and infant loss awareness day. If you’d like to join in and show your support, light your candles at 7pm and post your pictures on Facebook/twitter/Instagram/etc. Thinking of all the babies that should be with us now.